It was peak summer time in Kerala, but I was determined to check out one item from my Bucket list and that was to witness ‘Thrissur Pooram’ in all its glory. Our Journey this time was on the chariots of Indian Railways. For an overnight journey I believe trains are the best option if you are in India. You get food sleep and a comparatively safer journey. The journey began on the evening of 3rd May. Next day early morning we stepped out from the comfort of the AC coach of the train onto the hot and humid platform of Thrissur railway station. But this discomfort was short lived. From the day I landed in Thrissur I had decided that I will reserve a few lines in my blog post for the good natured people of this beautiful town in God’s Own Country. Unlike other major cities and towns in India I have found the people of Thrissur more polite, and tolerant towards outsiders. Right from the auto rikshaw and taxi drivers to the road side vendors are people willing to help and guide you. We took an Auto from the railway station to our hotel. The driver was kind enough to give us a quick tour of the city and informed us of the major attractions there and what timings were apt for each place. At the end of the journey he charged us a fee which I felt was reasonable (this happens rarely in Kerala as taxi and auto drivers never miss and opportunity to loot you). He even gave a breakup and an explanation of how the rates were decided. Soon after freshening up we decided not to waste a single minute. The next action item was to visit the ‘Vadakumnatha Temple’ and then have an authentic Kerala breakfast. We took a bus from our hotel to the temple, it was a short fifteen minute journey with the loud devotional songs typically played in these kind of small private buses in Kerala. You will have a conductor with a whistle in his mouth leaning at the doorstep of the bus swaying with every rash turn the driver takes, which will throw some passengers off their feet, who were not fortunate enough to get a seat. These buses are the lifeline of many villages and towns of Kerala and for people who are willing to be a bit ‘adventurous’ this can get you to a place in time without burning a hole in your pocket. The bus had a stop right in front of the temple. It looked very calm and quite. We saw people putting up bamboo structures that would serve as support for platforms for the media to cover the event. There were some smaller structures also, which were meant for the street vendors. We saw a couple of stalls being setup. Without wasting much time we went into the temple. This is by far the largest temple compound I have ever seen in Kerala. Legend says that this temple was built by lord Parasurama to atone for the sins of killing Kshatriyas. There are many stories associated with this temple. Since I am no expert on legends and folklore , it is better that my readers obtain these information from the right sources. But one thing that I can say for sure is that this is a marvel, it boasts the skill and craftsmanship of the architects of Kerala. The area around the temple once used to be a teak plantation which was cleared by Shaktan Tampuran to conduct the Thrissur Pooram. The place is still called ‘Thekinkadu’ which translates to forest of teaks. After a stroll through the rich history of the temple we went on to have breakfast in one of the nearby hotels, since it was still early in the morning we had limited options. After this we roamed around the city for some more time. Before I go into the details, I believe I should give my readers a quick introduction to ‘Thrissur Pooram’. Thrissur Pooram is a relatively young festival compared to other festivals in Kerala. Before the Thrissur pooram the largest temple festival in Kerala used to be the the ‘Aratupuzha Pooram’. Many of the temples participating in ‘Thrissur Pooram used to be a part of the Aratupuzha pooram. Once due to heavy rains some temples got delayed to participate and they were denied entry to the Pooram. Thrissur Poorma was a retaliation to that insult. The Maharaja of Kochi His Highness Rama Varma Raja also known as Sakthan Thampuran is considered to be the architect of ‘Thrissur Pooram’. He unified ten temples of the region and they were to participate in Thrissur Pooram making it the largest temple festival in Kerala. The major attractions of the Pooram are the processions by the constituent temples, the Elanjithara melam, Kudamattom, and the fireworks display. The 10 temples split themselves into two groups- some side with the Paramekavu Bhagavathy temple and the others with the Thiruvambadi Sri Krishna temple. The rest of the activities are like a competition between the two sides. Its an opportunity for both sides to show off the unity and determination of their devotees in making the Pooram a huge success. One of the major attractions of the pooram is the ‘Kudamattom’ where beautifully colored and decorated parasols are displayed. On the day before the pooram both teams put the parasols for public display. This is called the ‘Chamaya Pradarshanam’ which means display of decorations. We went to see the Chamaya Pradarshanam of Pramekavu Side. The next day again we reached Thrissur town in the morning. Processions from the constituent temples had started, the roads were free of Motor vehicles and Elephants had taken their place. Huge male elephants with long tusks and decorations carrying the idols of the temples. Though the whole setup looks magnificient, I felt pity to these large animals who seemed to be undergoing discomfort and were in great pain standing on the hot road under a burning sun with a large load on its back. These processions continued throughout the first half of the day. The famous Elanjithara melam that happens inside the temple compound started at around 3PM. We were just lucky enough to gain entry into the temple. The crowd was so large that at some point I even gave up the hope of getting in. I do not have words to describe the grandeur I saw there, the joy and excitement I saw on every face on that street. There were people from different parts of the world, from different walks of life. I was glad to be a part of the Pooram. I was impressed by the way the organisers of the Pooram were able to coordinate so many aspects. The way the Police, the people and the tourists cooperated to make this the largest temple festival in Kerala. I cannot claim to have witnessed the entire Pooram, I am yet to witness the Fireworks display. Afterall whats the fun if you finish off everything in one go its always good to leave something behind for later. Because that will serve as a motivation to come back again. It was the first day of a long weekend. While most of Bangalore was still slumbering, my wife and I had packed our bags and by 4AM we had hit the roads. This time our destination was a small hamlet somewhere in the State of Andhra Pradesh called Gandikotta. 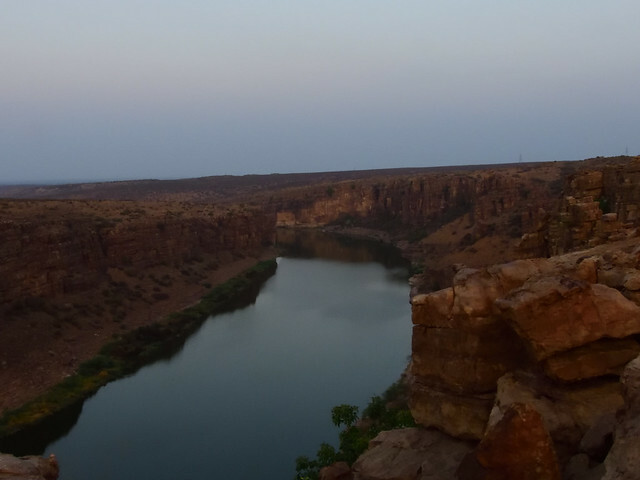 Known as ‘The Grand Canyon of India’, this place is still in its pristine form, not many tourists have started flocking in to see this natural marvel. This was almost a 300 Km ride so we decided to stop by at Belum Caves in Kadappa district. Even with the summer at its peak, a bike ride very early in the morning in Karnataka, is still very chilly. Almost an hour into the ride with my gloves and Jacket on, I was still shivering, Every passing minute I was dying for the sun to rise so that I could bask in the warm rays. By the time the Sun was at the horizon we had reached Le Pakshi. For people planning a visit to Gandikota from Bangalore I would suggest they cover, Le Pakshi, Belum Caves and Gandikota in a single trip. Following Google maps we had to leave the Highway and soon the roads turned into narrow roads. At the horizon I could see chimneys of a large factory, that explained the dust. We had reached Kadappa, A place famous for its granite stones. In every corner we could see slabs of stones piled up, some places the entire walls were made up of such stacks of granite slabs. There was a beauty to that symmetrical arrangement. It seemed as if some one with OCD had gone around town stacking every available slab of stone. Such views continued for almost half and hour and then at a distance we could see a white statue of Lord Buddha, we were almost certain that, that was our Belum caves. We reached just in time or rather before time. The ticket counters were just opening and a few of the staff had gone down the caves just to make sure it was safe for the tourists to go down the caves. We quickly grabbed a coffee from the APTDC canteen nearby. We were ready to explore the second largest underground caves in India. 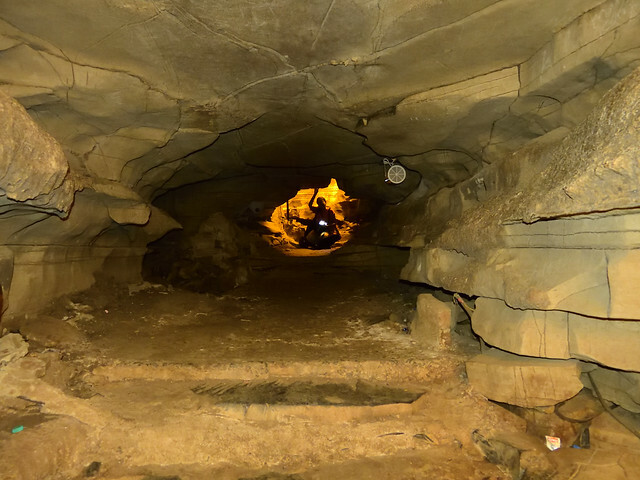 Belum caves is an underground cave system that has been formed naturally. 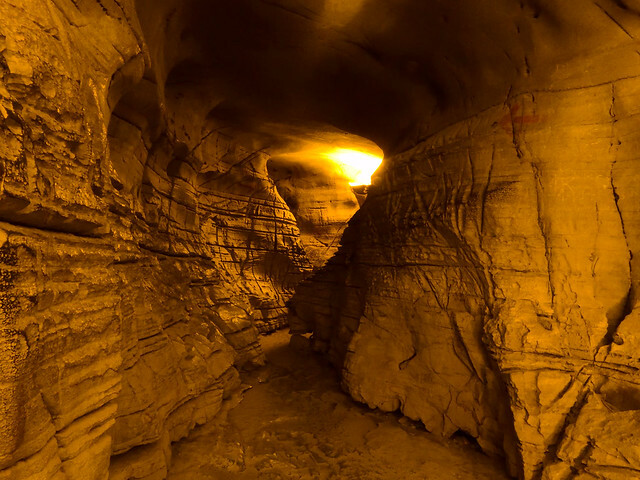 The place was discovered in 1884 by British surveyor and later by a German speleologist H. Daniel Gebauer explored the caves, there hall at the entrance into the caves is named after Daniel Gebauer. Being a dark and dingy place the cave is home to a decent number of bats. If you ever intend to take photos of this place do not even bother wasting your time and effort unless you have a tripod. The whole cave system is lit with dim lights and strips of LED. The dim lights infact add to the ambiance of the whole place. It was humid and we had started sweating. Since there were only very few people, I got enough space to calmly explore the whole structure. 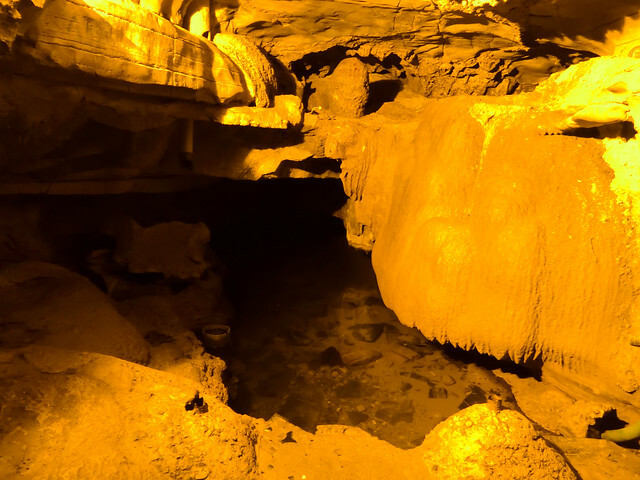 From the information I gathered about 3.5Km of the caves have been explored but only around 1Km is open for public access. As we went further deeper the pathways became narrower. 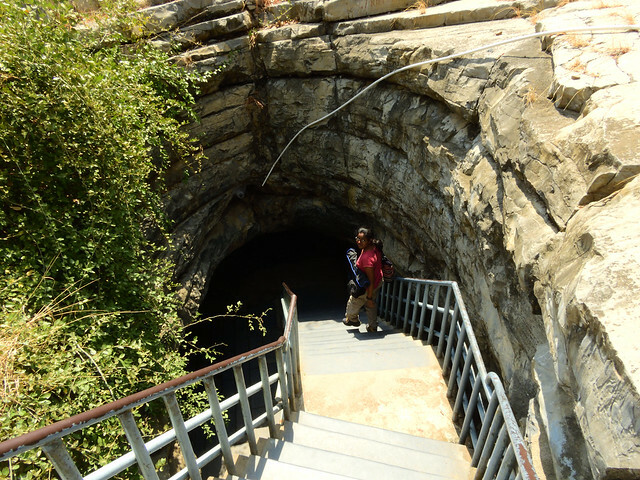 We went on until we reached Patala Ganga the deepest point in the cave system. After that exhausting journey we grabbed some lunch from the ‘Haritha’ restaurant by APTDC. A word of caution to fellow travelers, the entire route does not have any good place to eat, so it is advisable to carry food and water with you. We still had to cover a distance of 60Kms to reach Gandikotta. We left Belum caves with our minds still wondering how the caves would have been formed and if it indeed was a natural formation how mother nature does these tricks. The final 20 Kms of this journey was through a barren land, you can see the entire landscape and there was no sign of any hotel or resort. At this point the sun was at its peak and the Andhra summer is not something for the faint hearted. 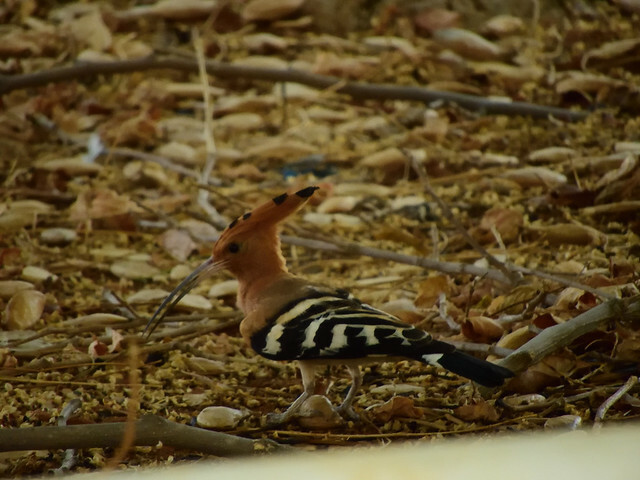 But I should admit that even barren land had a beauty of its own,unlike the concrete buildings of Bangalore. Except for the heat I was enjoying everything else on the way, and then suddenly out of nowhere we see some flags fluttering and on it the APTDC symbol. The whole place looked like a palace from a fairy tale. Both of us where completely exhausted quickly checked in had a second round of lunch and had a power nap. ‘Haritha’ run by the Andhra Pradesh Tourism department is the only hotel available in almost 70Km radius of this area. I was pleasantly surprised that although this is a government run hotel, still it had some pretty decent standards and the service was amazing. The only downfall is that the staff speak only Telugu, a few of them can understand English or Tamil. We managed with English, these folks are so cooperative and dedicated that soon the language will not be a barrier. Our room boy told us that we should head to the Juma Masjid which was half a kilometer from the hotel for a sunset view. 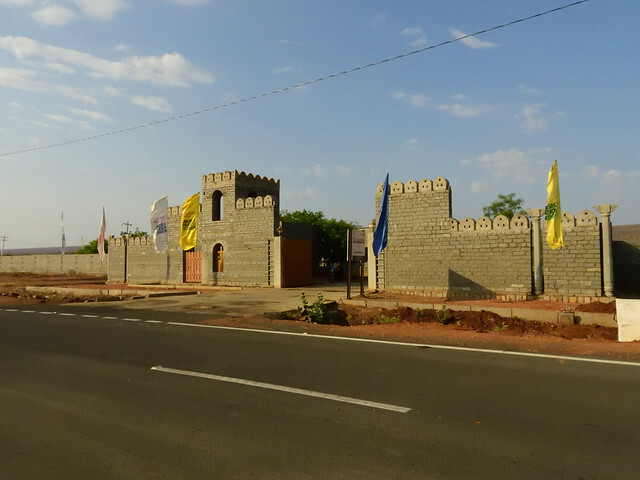 We drove through the Gandikota fort and on the other side were a couple of small houses which was still inhabited by farmers. The road led us straight to the Juma Masjid. We went around the place. There were a couple,of tourists scattered here and there but the whole atmosphere was calm and peaceful. 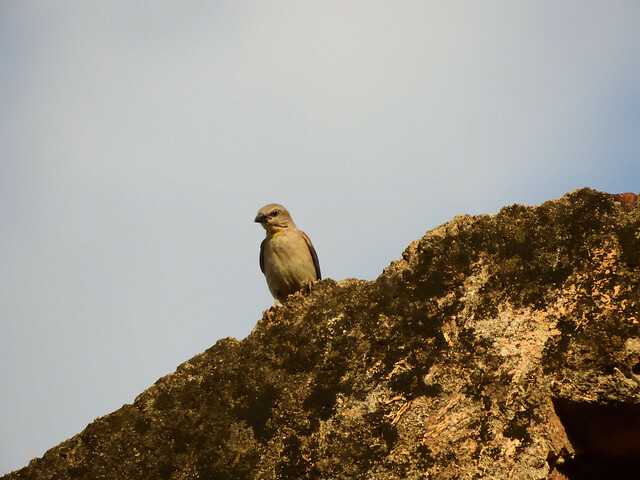 The place also had a decent number of birds especially laughing doves, bushchats, sparrows, hoppoes, purple sunbirds and Red Vented Bulbuls. A few minutes walk from the Juma Masjid will take you to a breath taking view of Penna River flowing in between two cliffs. From the day I had been planning this trip I was skeptical whether Penna river would still have water flowing in this summer. But those doubts soon vanished. We climbed up some of those rocks to get a good view of this magnificent river and the path that it had cut out for itself over the millenniums. The sun was slowly setting behind us. It felt as if the sun was also peeping from behind us to get one last glimpse of the Penna River before it went down. Soon after sunset we headed back to our room to enjoy the hospitality offered by APTDC.